Some people choose a vehicle based on its exterior style. While this is a great idea, most of your focus should be on the inside. After all, this is where you’ll spend most of your time. The 2017 Jaguar F-PACE has an attractive and comforting interior that every Rumson driver will want to experience, thanks to its premium materials and all-around comfort. See for yourself why it’s the right choice. Holmdel drivers will appreciate being surrounded by luxury when they choose to bring home the Jaguar F-PACE. Inside the cabin, you’ll find premium leather seats that perfectly wrap your body in a sense of comfort never before experienced. The sophisticated finishes on the dash and along the doors also create a statement that you’re not driving in a regular vehicle—you’re driving in style. Sometimes your Colts Neck drive deserves a little extra, and the Jaguar F-PACE gives you exactly what you want. The Configurable Interior Mood Lighting adds a touch of elegance to the interior and sets the tone by offering ambient lighting in 10 different areas. You can choose between 10 different colors, so you’ll be able to match your mood at all times. 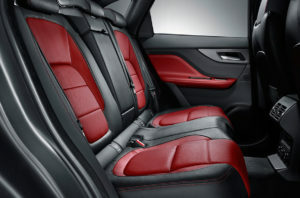 Backseat passengers usually feel left out, but not when they’re seated in the Jaguar F-PACE cabin. Not only is there enough room for three adults to sit comfortably together, but you can even recline the rear seats for optimal comfort. Basically, everyone will be fighting to sit in the back now instead of calling for “shotgun”. The Rumson views are something to enjoy, and the panoramic roof makes them easy to see, no matter where you’re seated. Plus, this panoramic roof opens, so you can experience the fresh air and enjoy the wind in your face. In addition, it adds a spacious touch to the interior, and the effective tinting helps keep the sun’s rays from heating up the interior while offering a necessary level of privacy. The interior of the Jaguar F-PACE offers a multitude of technology features you’ll enjoy having access to. For starters, the rearview camera helps ensure you always have a clear view of your surroundings, allowing you to make better driving decisions. In addition, the InControl® systems deliver premium entertainment and information options that enhance the Holmdel driving experience, while the enhanced navigation makes it easy for you to arrive at your destination. The 2017 Jaguar F-PACE is an excellent vehicle for those Colts Neck drivers looking for an innovative and intuitive interior. With ample mood lighting, relaxing features, a panoramic roof, and premium materials, there’s nothing this vehicle doesn’t offer. Visit Jaguar Monmouth today, located at 807 NJ-35 in Ocean Township, to see our inventory. You can also contact us by calling (877) 672-8680 to schedule a test drive or apply for financing.